Oct 13, 2017; Syracuse, NY, USA; Clemson Tigers quarterback Kelly Bryant (2) reacts during warm ups prior to the game against the Syracuse Orange at the Carrier Dome. Bryant elected to transfer from Clemson after the fourth game of this season when he was demoted in favor of freshman Trevor Lawrence. 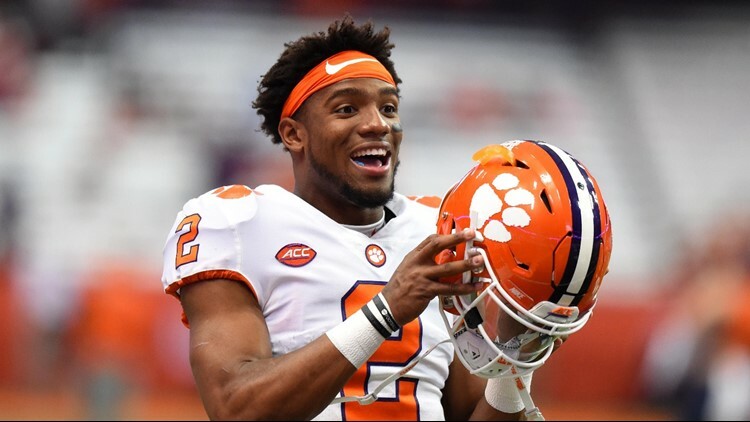 CLEMSON, S.C. — Former Clemson quarterback Kelly Bryant will remain a Tiger. Except instead of orange and white, he will wear black and gold. Bryant will sign to play his final season of eligibility at the University of Missouri, he announced Tuesday. Bryant chose Mizzou and coach Barry Odom over Auburn, Arkansas, Miami, Mississippi State and North Carolina. Bryant elected to transfer from Clemson after the fourth game of this season when he was demoted in favor of freshman Trevor Lawrence. The NCAA loosened stipulations on redshirts before this season. Players are permitted to participate in a maximum of four games before exhausting a year of eligibility. Bryant, a senior athletically and a graduate academically, will be eligible to play at Missouri immediately next season. He will facilitate a smooth transition after the departure of Missouri senior starter Drew Lock, who earned second-team All-Southeastern Conference honors this season with 3,125 passing yards, 25 touchdowns and eight interceptions. The only other quarterback to log snaps for Missouri this season is redshirt freshman Taylor Powell. He appeared in six games and attempted merely 14 passes. Bryant's experience and sharpened skills could help Missouri sustain its offensive productivity. Bryant compiled a 16-2 record as a starter at Clemson. One loss was an upset at Syracuse that Bryant departed early with an injury. The other loss was to eventual national champion Alabama in the College Football Playoff Sugar Bowl semifinal. Bryant passed for 3,258 yards, 15 touchdowns and nine interceptions in those 18 games. He rushed for 809 yards and 13 touchdowns. He led Clemson to an ACC Championship and victories against three Southeastern Conference teams— Auburn, South Carolina and Texas A&M. Bryant will fit well in Missouri offensive coordinator Derek Dooley’s fast-paced, balanced scheme. Mizzou ranks among the Top 4 of the SEC in scoring, passing, third-down conversion percentage and total offense. In the passing attack, Bryant will benefit from the return of Lock’s top two targets, receiver Johnathan Johnson and tight end Albert Okwuegbunam. Bryant will also augment Missouri's running game. Lock netted merely 145 yards on 49 carries this season. Bryant will complement tailback Larry Rountree III, who led Mizzou with 1,012 rushing yards and 10 touchdowns. Missouri closed the regular season with an 8-4 overall record. It finished fourth in the SEC East Division. Missouri will face Oklahoma State in the Liberty Bowl on Dec. 31. Bryant could elevate Missouri’s standing if he continues a personal winning streak. He has never lost a game in Columbia. While at Clemson, Bryant enjoyed three consecutive victories against South Carolina in the Palmetto Bowl rivalry, including two in Columbia, South Carolina. Bryant will lead this set of Tigers against the Gamecocks on Sept. 21, in Columbia, Missouri.